You’ve just started planning a renovation and you’re feeling a bit overwhelmed and worried about whether you’ve got the budget for what you want to achieve. Or perhaps you’ve already got your plans drawn up, you may even be about to start your build - but you have some questions you need answered and you’re budget is starting to blow out. You could do with some help to get things back on track. You are managing most of the design decisions yourself but really wish you had a little bit of help from someone with more experience to just make sure you’re making good choices and spending in the right places. You’ve heard of horror stories about renovations and just wish you knew a little bit more so you were more confident in managing the trades, knowing the common pitfalls to look out for and being able to tell that things are going how they should. You’re on a strict budget - there’s no room to pay an interior designer to get things designed professionally, anyway you’re pretty confident in your taste and ability to make the decisions on your own. You want your budget to stretch as far as possible. You would love a few tips on what to spend on and where you might be able to save - without sacrificing the overall design. You spend lots of time looking on Pinterest, Instagram or Houzz. You know what you like when you see it. But you’re not 100% confident in pulling it together. You would love a bit of support. You’ve got your plans all drawn up but think there might be a few tweaks that are needed to make it even more perfectly suited to your family’s needs. You would love a second opinion to just bounce ideas around and make sure it’s exactly right before you start the build. If any of the above sounds like you then you’re in the right place! If you’re planning a renovation or about to start one then a Reno on Track session is exactly what you need to make sure you are prepared and know what you’re doing. For a fraction of the cost of hiring me as a full service interior designer I will teach you the tricks I use with my clients to create the designs you see on Instagram and Pinterest while sticking to a tight budget and avoiding common mistakes and pitfalls. As we talk through each room you’re renovating you will learn what to spend and save on, which order you should do things in and common issues to look out for. I will answer any design questions you may need support with, review your plans (if you need that) and help you resolve anything that’s worrying you about your renovation. By the end of our session you will feel fully confident to move forward with your renovation, knowing that you can tackle issues as they arise and have a design that is beautiful, yet will stand the test of time. The Reno on Track session is a 90 minute online consultation held with The Little Design Corner Director, Clare Le Roy. 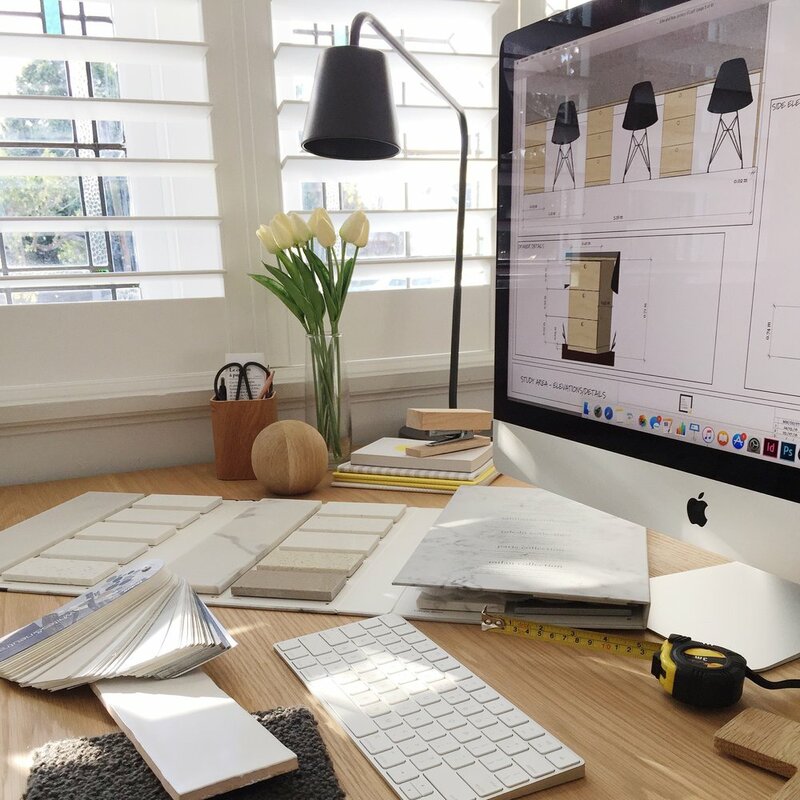 Having helped more than 100 design clients since I launched my business in 2015 - with projects ranging from as low as a few thousand dollars all the way up to $1 million or more - trust me when I say I’ve seen EVERY renovation drama unfold. I can definitely help you make sure you avoid common issues and budget nightmares during your own renovation. During the session we will talk through each area of the house you’re renovating and the common issues and pitfalls to look out for during your renovation. I will review your plans (if you have them) and let you know my thoughts and advice on those. We will talk about design selections and suppliers and will spend time looking at ways you can save your precious renovation budget and direct it most wisely. I will make sure you also have time to ask me all the questions you might be struggling with at whatever stage you are at in your renovation planning. You will come away with a wealth of knowledge and feel confident that your renovation is 100% on track, especially if you’re on a tight budget. are currently planning or about to start a renovation. Whether you’ve only just starting looking at ideas on Instagram/Pinterest or whether you’ve already got your plans drawn up and builder locked in, this session will cover information at whatever stage you’re at and make sure you’re completely confident and on track with your renovation. Even if you are worried you don’t have any plans or much of an idea what you need help with yet this session will give you so much confidence as you continue to plan and execute your renovation. The more information you have earlier in the process the more money you will likely save as you go along. are mostly looking after your own renovation but lack a bit of confidence to make final design decisions on your own. You may even have made all your selections but you would feel more confident just bouncing your ideas off someone with experience. are on a tight budget and want to make your renovation budget stretch as far as possible - you have your heart set on images you’ve seen on Instagram and Pinterest but just not sure how to get that look on the budget you have. know what you like but aren’t sure how to pull it all together and would like someone who knows what they are doing to give you some confidence that the choices you are making are on track and won’t date. would love to engage an interior designer but feel it is an extravagance you can’t afford. Working with me in this way is a great way to get lots of advice at the fraction of the price of hiring me to do your full service interior design work. spend hours looking around on Pinterest/Instagram/Houzz and feel a bit overwhelmed. You feel pretty confident you are on the right track but an extra set of eyes and some advice about a few things here and there would make you feel SO much better about moving forward on your own. When I first find Clare’s website and looked at her past projects, we knew she is the ONE we needed for our home renovation and styling. Now the reno has fully completed, we are so happy that we choose Clare to be our home interior designer!!! She is absolutely amazing on the job. From our very first meeting she was extremely professional and thoughtful during the whole process. Clare made myself and my husband think about exactly was possible with our limited budget. Advice on whatever you need help with. For example: renovation tips and tricks to avoid big mistakes, budget advice, space planning advice, fleshing out a scope of works, reviewing and adapting your existing floor plans, family friendly interiors, supplier or product advice - or if you aren’t sure what questions you have then we will talk through what you’re planning and I will provide help with whatever it is you are working on. Trust me I have so much advice for you, even if you’re only just starting to plan and don’t know what to ask me! A comprehensive list of my suppliers and "where to shop". We have arrangements with many suppliers and access to generous trade discounts (up to 40% in some instances). If you would like to just get my supplier list as a quick and easy way to get started you can find that in the Reno Resources area. My “Reno on Track” cheatsheet. A room-by-room checklist that will give you an overview of what to look out for as you renovate every room in your house. My renovation heights and measurements cheatsheet. Not sure how high your kitchen bench should be? Or how much clearance you should leave for your toilet? This cheatsheet will list out common heights and measurements I use in my client’s renovations. All the thinking has been done for you! My tips, tricks and cheats for how to mix and match high and low end pieces to help you make the most of your renovation budget while achieving a look that is authentic and meaningful to you and your family. Advice on where to spend and where to save, which will ultimately save you lots of money and mean you are left with a timeless design that won’t date and will last you and your family for years to come. Overall you will come away with lots of practical tips and new ideas to implement that are tailored specifically to your home and your project. To make a booking simply select your time zone to see available appointments and book in at a time that suits you. Prior to the consultation you will be asked to send some information about your renovation project so I can prepare for our session. Due to the full service projects I have on the go only a limited number of sessions are offered each week and these generally book out quite far in advance. Please book ASAP to avoid disappointment.